Medical Tourism in Crete. Health Care at its best. The patients and their individual needs are central to the philosophy of the Private Hospital Tsepeti. As increasingly more people seek better healthcare services outside their home country, we have developed an International Patient Department (IPD), offering its services for patients and visitors from all over the world. 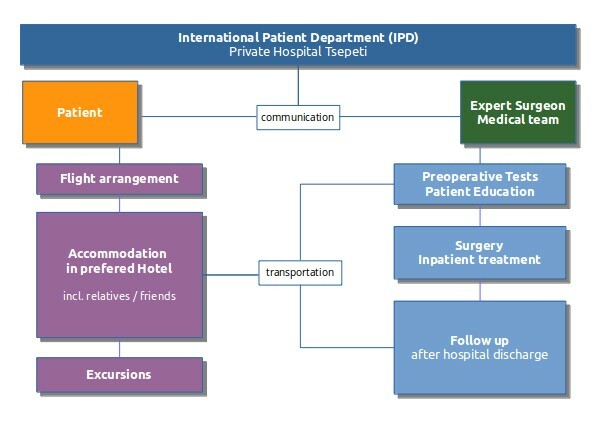 IPD coordinates the needs for all international patients prior to their arrival, during their stay and upon discharge, in a friendly and professional manner. Highly qualified medical specialists Private Hospital Tsepeti has set up a scientific network of highly qualified, associated physicians from all over the world with permanent or temporary residence on the island of Crete. Our international co-operations with academic institutions and major hospitals in Europe and in the US ensure the continuous exchange of scientific know-how and the provision of up-to-date medical services. The procedures, usually provided to our international patients, concern the segments of plastic surgery, minimally invasive and laparoscopic surgery, weight-loss surgery, orthopedic and spine surgery, as well as hemodialysis during vacation. Hospitality Services Our International Patient Department (IPD) can arrange a broad range of hospitality services that ensure a pleasant, convenient and stress-free stay for all our international patients and their relatives. Inpatient stay The Private Hospital Tsepeti provides comfortable single and double rooms as well as deluxe rooms and suites. There is the possibility for a member of the patient’s family to stay and keep company (rooming-in). In the rooms you will find a private bathroom, air conditioning, flat screen TV, refrigerator, telephone and free wireless internet. Many rooms also have a balcony.